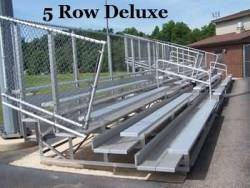 These 5 row 27 foot deluxe stadium bleachers with aisles are great for baseball, football and soccer fields, and our low prices make this a no brainer! Our bleachers with aisles will allow your spectators to easily walk up and down the bleacher steps without fear of possibly falling. The mid aisle handrail provides the needed support.